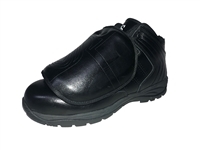 The official MLB footwear, this plate shoe is designed for and worn by Major League umpires. Available in All Black or Black with White logo. The official MLB footwear, this plate shoe is designed for and worn by Major League umpires. Available in All Black or Black with White logo.